View of Ennerdale Lake in Cumbria, Northern England. 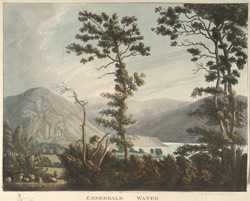 Ennerdale Lake is the most westerly of the lakes in this area and in the late 18th century when this painting was completed it would have been quite inaccessible. The lake is two and a half miles in length, three quarters of a mile in width and approximately 148 feet deep. Ennerdale lake is supplied by the River Liza and itself supplies water to Whitehaven.